Dhaka, Mar 25 (Just News): The BNP-led 20-party alliance will boycott the next general election if its chief Begum Khaleda Zia cannot take part in it. Top leaders of the alliance unanimously took the decision at a meeting on Saturday night. The two-hour meeting that began around 7am was held at BNP Chairperson's Gulshan office. But there was no media briefing about the outcome of the meeting. Contacted, Labour Party chairman Mostafizur Rahman Iran said that they unanimously decided at the meeting not to join the next election if BNP chairperson Begum Khaleda Zia is not released from jail to join it. He said the alliance leaders also decide that they will not make any contradictory remarks about the next general election. "We'll talk before media in line with our alliances' decision to avoid confusion among people about our stance on the polls." M Golam Mostafa Bhuiyan, secretary general of Bangladesh NAP, echoed Iran and said the 20-party will participate in the next polls freeing Khaleda Zia from jail, not without her. Another leader wishing anonymity said they suggested the BNP leaders to keep the representatives of the 20 parties on board during their meetings with foreign diplomats. He said they also decided to take coordinated programmes seeking Khaleda Zia's release and intensifying its activities through top leaders' visit to different districts. The alliance leader said BNP standing committee member Nazrul Islam Khan has been made new coordinator of the alliance as BNP secretary general Mirza Fakhrul Islam Alamgir remains busy with party activities. It was the second meeting of the alliance leaders since BNP chief Khaleda was put in jail after being convicted in the Zia Orphanage Trust case. 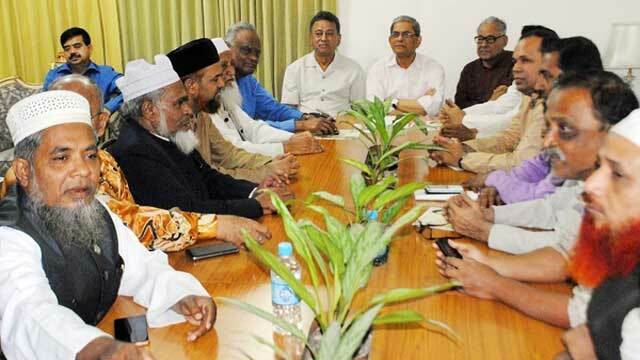 Three days after she went to jail, the top leaders of the 20-party alliance had a meeting with the BNP standing committee members on February 11 where they expressed solidarity with BNP's programmes for unconditional release of its chairperson.